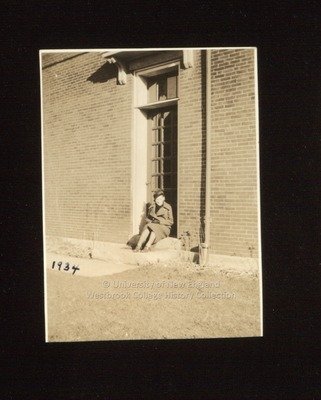 A Westbrook Junior College student sits in the entrance of a brick building in this sepia toned candid snapshot labeled 1934 on the front. She wears a winter coat with a wide collar, a felt hat tipped to the right side of her head, and nylons with low heeled shoes. On the back of the photo is written in blue ink: Helen Palmer.